A weekly newspaper reporter is moving on after 12 years to launch his own public relations business. Nigel Canham, pictured left, is leaving the Tindle Newspapers-owned Mid Devon Advertiser Series to set up Strategy Public Relations, partly to enable him to work flexibly from home in order to support his wife who has MS.
Said Nigel: “It will be a wrench as I’ve greatly enjoyed the challenge of keeping up with the district’s news and still managing to deliver scoops in an ever-increasingly digital age. 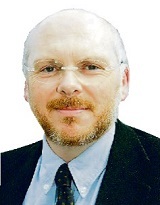 Chris Caulfield has moved from being the chief reporter on the Sutton Guardian to news editor of the Richmond & Twickenham Times and the Wandsworth Guardian. Joanne Birtwistle, publications editor for TheBusinessDesk.com, has returned from maternity leave. Sophie Brownson has been appointed senior reporter at the Sunderland Echo. Senior reporter Douglas Dickie has been promoted to editor at the Rutherglen Reformer, succeeding Kenny Smith who has moved on to sister publication, the Ayrshire Post. The Islington Gazette has appointed James Morris as a reporter. James previously spent three years as a senior reporter with the Congleton Chronicle Series. Charlotte Ikonen has moved from the role of senior reporter at the St Albans and Harpenden Review to chief reporter at the Watford Observer and St Albans and Harpenden Review. On the move yourself? Email editor@htfp.co.uk with the details. You’re very kind Jeff Jones, many thanks.